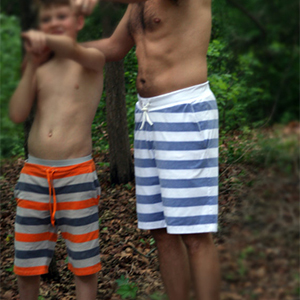 Finally a fantastic teen and men's shorts pattern! Your guys will live in these all year long. They feature an elastic waist with a drawstring for additional support and looks. The instructions include a great tip on drawstrings that you will love and use over and over! They also have big slant side pockets for his phone and wallet. This pattern is for XS up to XXL or a measured waist of 27" to 47". Recommended fabric is a french terry or sweatshirt type medium weight cotton knit or cotton spandex/lycra knit.